when I've hurt my lower back? Exercise can be the key to recovery from back pain, as well as a good prevention against future pain. Stretch only as far as is comfortable. If any of these stretches cause pain. Stretch to the point of "MILD TENSION". Hold each stretch for about 15-20 seconds. Strong stomach and back muscles help protect your back! Arch your upper back upwards. Contract your stomach muscles, and let your head drop. Raise your head and let your back drop back down. Avoid pushing your pelvis forward to create a swayback. 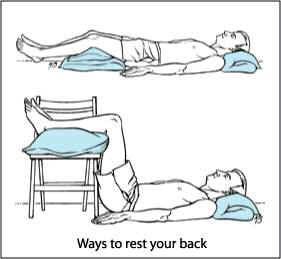 Lie flat on your back with your legs straight out. Place your hands on your LEFT knee and pull it toward your chest. Place your hands on your RIGHT knee and pull it toward your chest. Pull both knees in to your chest. Lower your legs to the floor. Slowly raise your shoulders off the ground. Reach with both hands toward your knees. Slowly lean back onto the floor. Stand with hands on hips, feet apart. Slowly twist to the RIGHT at the waist. Look over your shoulder as far as you can. Slowly twist to the LEFT at the waist. Stand with LEFT leg in front of the right leg. Bend knees slowly, sinking into a lunge. Keep your LEFT knee directly above your LEFT foot. Stand with RIGHT leg in front of the rleft leg. Keep your RIGHT knee directly above your RIGHT foot. * Don't lift by bending over. Bend your hips and knees and squat. * Keep your back straight and hold the object close to your body. * Avoid twisting your body while lifting. 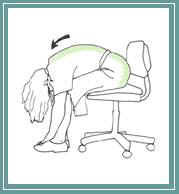 * If you must sit at a desk or at the wheel of a car for long hours, take breaks and stretch. * Wear flat shoes or shoes with low heels.